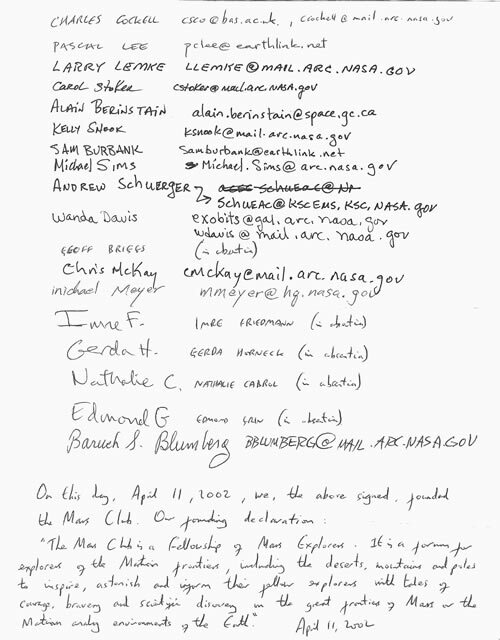 The Association was founded on April 11, 2002 as ‘The Mars Club’ by a group of 19 Founding members, amongst them Nobel Laureate Baruch Blumberg, who gathered in the Saint Stephen’s Green Pub in Mountain View, California. At that meeting the Founding Declaration was adopted. The Founders declared the Mars Club as a forum for expeditioners and explorers interested in exploring the frontiers of Mars, including the deserts, mountains, poles and caves. It also included within its remit those who have explored Mars analog environments, which could include analog environments on the moon. Mars analog environments are environments that are similar to Mars, like regions in Antarctica or the Arctic. At the time of writing there have been no human expeditions to Mars. Those that have an interest in Martian exploration can find expression of their ambitions through these environments. Mars analog environments also underscore the connections between Earth and Mars explorers and their common vision of exploration.